Stamford AFC look to move a step closer to the first round proper of the FA Cup tonight (September 20, 7.45pm). The Daniels host fellow Evo Stik League Division One side Gresley in a second qualifying round replay at the Zeeco Stadium with a third qualifying round trip to AFC Mansfield on offer for the winners. Stamford are effectively three wins from the first round and a possible tie against the likes of Peterborough United. Stamford and Gresley drew 1-1 in their original tie on Saturday (September 17) with the local side conceding a 97th-minute equaliser. The Daniels have struggled in the league so far this season - they sit next-to-bottom in the table - but in contrast local rivals Spalding United have been flying. 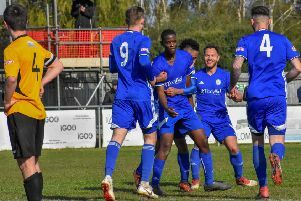 The unbeaten Tulips hit top spot on Saturday after making it five wins from six games and they will expect to still be at the summit following tonight’s match at mid-table Belper Town. There’s an attractive fixture in the United Counties Premier Division tonight when free-scoring sides Wisbech Town and Yaxley clash at Fenland Park. A win for either side would move them into the top half of the table. It’s also a return to Fenland Park for former Wisbech boss Brett Whaley who is now in charge of Yaxley for a second spell. Whaley admits he didn’t enjoy the experience of managing Wisbech, a club he left after less than 12 months in charge last March. March Town United will attempt to climb away from the lower reaches of the Eastern Counties First Division with victory at Downham Town. The scheduled Lincs Senior Trophy tie between Deeping Rangers and Sleaford at Outgang Road has been postponed after the latter can’t raise a side. Downham Town v March Town United.